I love this Connie, looks brilliant on Kraft card. Great CAS design, Connie. The image really pops against the kraft. Thanks for playing along with the Holiday Chaos week at Catch the Bug! Lovely card. Thanks for joining us at Catch the Bug/Bugaboo for our week-long Holiday Chaos event. Good luck. Coloring on kraft creates a great look. Love your cute card and am so glad you shared at Jo's Scrap Shack. I really like the image on the kraft and the CAS card. Thanks for joining us at the Holiday Chaos 2017 Merry and Bright Challenge, Lisa Lynn GDT. A different hat now, love your coloring. Thanks for joining us at Imagine That Creative Playground, Lisa Lynn DT. Oh I love your reindeer. It's so funny! Thank for playing with us at Di's Digi challenge. I love the look on that adorable deers face! Looks like he has been out in the cold for too long! 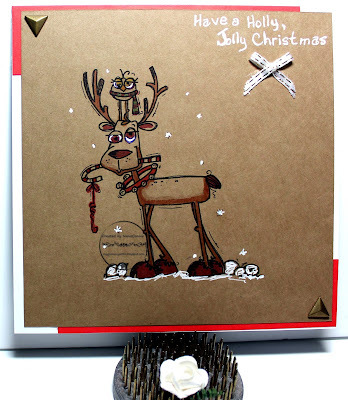 This is such a wonderful card, love the reindeer and the effect of the white colouring against the Kraft coloured paper. Looks quite dramatic. Such an adorable card Connie! Thank you for sharing with us over at Imagine That Digistamp Link Up! We hope to see you again! Wish you a happy merry christmas! Gorgeous card, love the kraft card. Thanks for joining in this months 'Christmas' challenge over at Crafty Calendar.